I haven't done a skincare routine post before so I thought it was about time. My skin is far from perfect and I tend to get hormonal spots on my chin but I have found some great skincare to help with dehydration. I've been using the above products for at least a month, most of them for longer so I've had a fair chance to test them now and I feel like I can give a fair opinion on them. 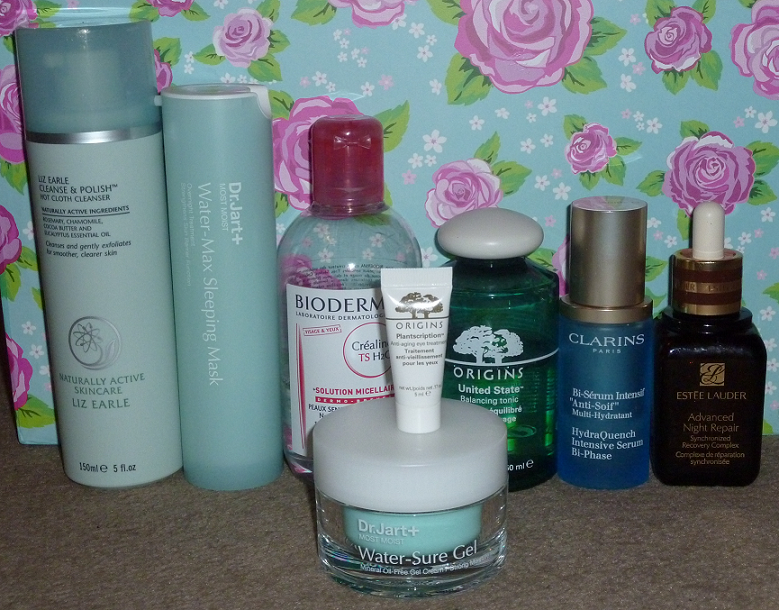 I'm going to split up the products to show you what I use in the mornings and evenings. In the morning I don't use a cleanser in the shower as I give my skin a good cleanse at night and my skin can get too dry or irritated if I use too many cleaning products. I simply wash my face with lots of warm water to ensure I remove any traces of moisturiser/treatments from the night before. After my shower I use the Bioderma Crealine Solution Micellaire to remove any final traces of panda eyes from the previous day. I'm not amazing at getting rid of all my mascara for some reason! I use the Origins United State Balancing Tonic to refresh my skin and lightly remove dead skin cells. This is a nice alcohol free toner that doesn't sting my skin. It has a citrus-like scent which I like and it prepares the skin nicely for my next step. Prior to applying moisturiser I use a serum to help increase the hydration levels in my skin. 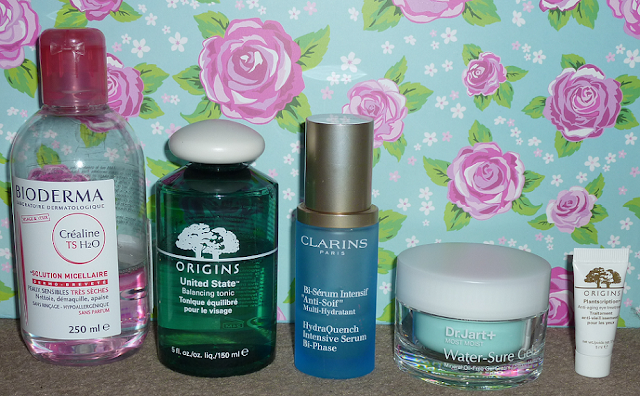 I love the Clarins HydraQuench Intensive Serum as it's very watery and light. It makes your skin feel really smooth without adding a greasy sheen. Occasionally I've worn this alone, without moisturiser and my skin hasn't felt too dry so it's really great at adding moisture to the skin. Dr Jart+ Most Moist Water-Sure Gel has been a fab recent addition to my routine. I love the texture of this gel-cream moisturiser. It feels light on the skin but deeply moisturises the skin leaving it feeling like silk. It's great for my dehydrated skin but it may be great for those with oily skin who need something extra in the winter too due to it's mineral oil-free formulation. The final step in my morning routine is the Origins Plantscription Anti-Ageing Eye Treatment. I only have this in sample size but it's been a welcome change from my other eye creams as I felt like they weren't working for me. I normally prefer a thick cream formula but I've been enjoying this thick serum style treatment. It's really nourishing on my eye area and makes it easy to apply concealer over the top. I would love to buy the full size version but it's pretty pricey at £36.00 for 15ml! I love smothering my face in Liz Earle Cleanse & Polish during my night time shower. It's so thick and creamy, it feels like I'm really pampering my skin. It's great at cleaning the skin without stripping moisture, something that happens with a lot of wash off cleansers for me. I mostly wash this off with a flannel as I prefer this to the muslin cloths. 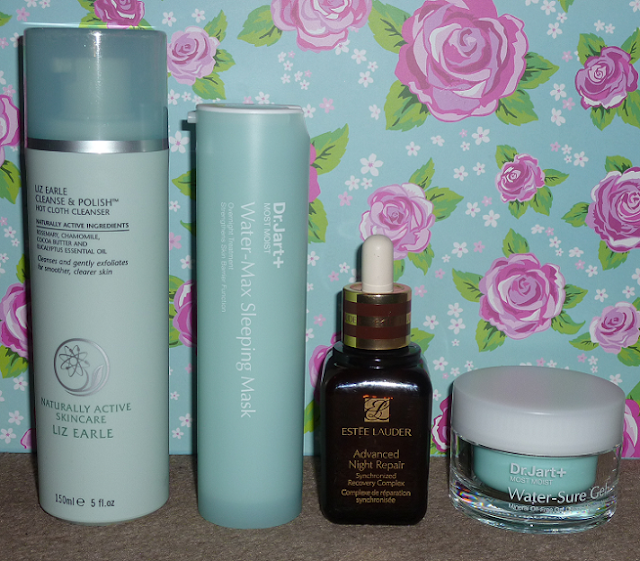 Before bed I apply the Estee Lauder Advanced Night Repair. This is quite a thick serum that feels luxurious on the skin. It sinks in pretty quickly so you're not going to be left with a wet face when you go to bed! I find this does wonders on spots and redness on the face as I often wake up with better looking skin after going to bed with this on. Rather than use a separate night cream, I apply the Dr Jart+ Water-Sure Gel again as I really do enjoy the moisturisation effects on my skin. If I feel like an extra boost of moisture, rather than use the moisturiser, I use the Dr Jart+ Water-Max Sleeping Mask instead. This is a mask that you leave on overnight and it has such long lasting results on my skin. My skin feels like velvet for almost 24 hours after using this! I did a full review on this here if you want to know more. I hope you've enjoyed reading about my skincare routine. I'd love to hear about yours too so please leave a comment to let me know your favourite skincare products.